ETC’s rectangular hyperbaric chambers are easy to use and arranged for best ergonomic comfort as well. The system was designed with easy to access chamber door controls, lighting levels, thermal and humidity controls, gas analysis and an entertainment system. ETC’s rectangular hyperbaric chambers are specifically designed to utilize state-of-the-art technological advancements in the field of hyperbaric treatment care in order to provide the best experience available on the market today. These chambers are secure and efficient for clinical hyperbaric oxygen therapy. ETC has served as a primary leader in the field of hyperbaric treatment care for years, and continues to carry the torch by paving the way in future advancement in the field, providing necessary resources for scientists to continue research for optimization of hyperbaric technology. 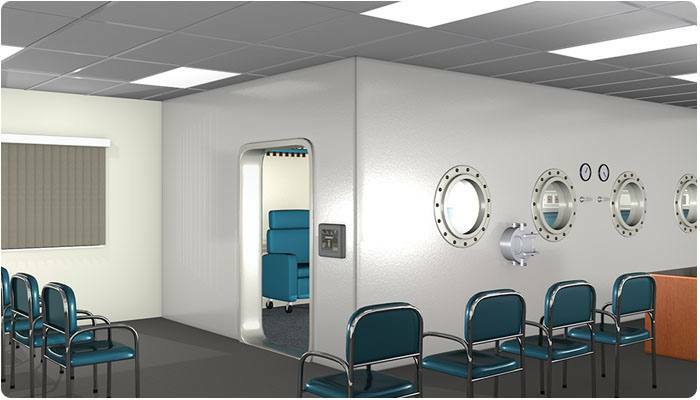 ETC’s rectangular hyperbaric chambers stand out amongst the plethora of available hyperbaric treatment options because of its engineering which is designed to meet and exceed the rigorous standards for health care facilities set by the ASME PVHO-1 as well as by the National Fire Protection Association. ETC’s rectangular hyperbaric chambers are easy to use and arranged for best ergonomic comfort as well. They allow for easy operation of chamber door controls, lighting levels, thermal and humidity controls, gas analysis and entertainment system. Interested in learning more about the Rectangular Multiplace Hyperbaric Chamber from ETC Biomedical Systems or the other new and used hyperbaric systems that we sell? Fill out the contact form below or contact us today to speak with a knowledgeable customer service associate.